Fioretto Pecorino Sepi whole loaf approx. 3 kg. incl. 4 % Tax excl. This article will be sent refrigerated. Buy now this product together with Toma Piemontese D.O.P. Beppino Occelli loaf approx. 7 kg. Toma Piemontese D.O.P. Beppino Occelli loaf approx. 7 kg. ready for shipment: in ca. 5 days Toma Piemontese D.O.P. Beppino Occelli loaf approx. 7 kg. Olive oil extra virgin Integral Redoro Frantoi 1 lt. The Extra-Virgin Olive oil of "Integral" quality is a particularly tasty oil of sweet taste, full-bodied and fragrant. It is obtained with the cold extraction of olives of particular quality that allows the oil to retain its natural organoleptic properties unaltered. The Integral oil is healthy and rich of trace elements which are precious for our health. Canestrato Il Saraceno Nonno Lancia approx. 1 kg. 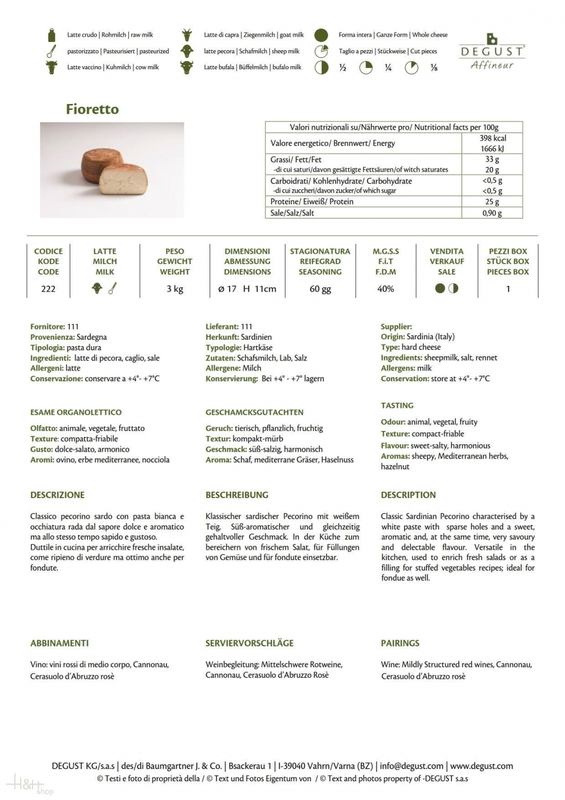 Table Parmesan Stravecchio Montanaro approx. 500 gr. - Dairy Mondolatte Tre Cime 9,75 EUR / 19,50 €/kg. Parmigiano Reggiano piece of approx. 300 gr. - Antica Formaggeria Spa 11,35 EUR / 3,78 €/100 gr. Blu di Bufala Cheese Dairy Quattro Portoni approx. 500 gr. 27,95 EUR / 55,90 €/kg. Pecorino Fiorino Gigante Dairy Il Fiorino approx. 500 gr. 26,50 EUR / 53,00 €/kg. Grana Trentino Trentingrana piece of approx. 500 gr. 14,70 EUR / 29,40 €/kg. Tuma d'la Paja Cheese Beppino Occelli approx. 300 gr. 12,55 EUR / 8,37 €/100 gr. 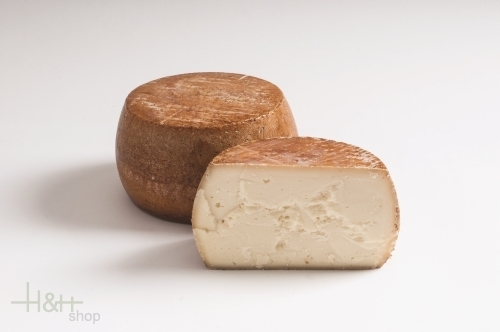 Taleggina Oro Cheese Dairy Zani ca. 300 gr. 7,45 EUR / 24,83 €/kg. Sheep's milk cheese Pecorino Riserva Tuscany Nocetto app. 1,3 kg. - Spadi Enzo 39,85 EUR / 3,07 €/100 gr. Sheep's milk cheese Pecorino Tuscany Il Grotta app. 2,8 kg. - Dairy Spadi Enzo 79,55 EUR / 28,41 €/kg.